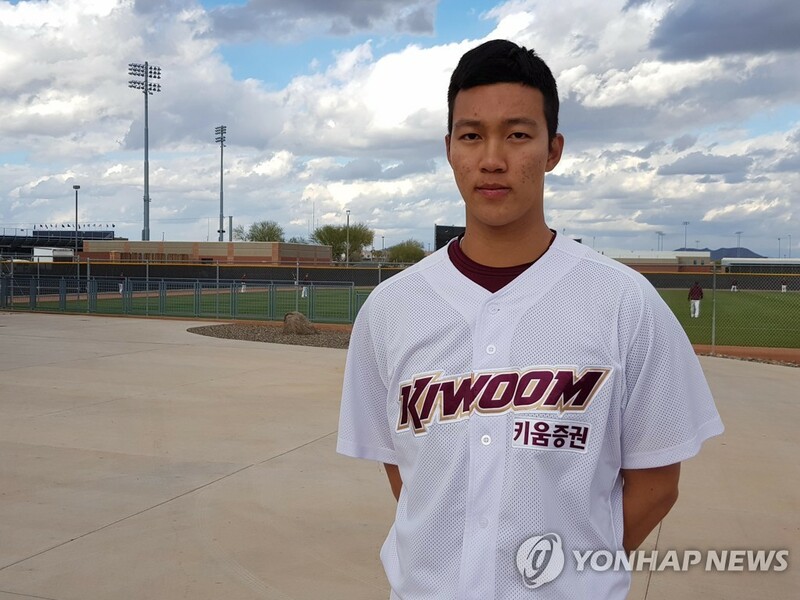 SEOUL, March 14 (Yonhap) -- An Woo-jin, a 19-year-old pitching sensation, put together a strong preseason performance for the Kiwoom Heroes on Thursday, as he gears up for his first full regular season in the Korea Baseball Organization (KBO). An held the visiting Lotte Giants to two runs on two hits in 4 2/3 innings, as the Heroes prevailed 8-3 at Gocheok Sky Dome in Seoul. He struck out five and walked four, and those two Lotte runs came on a two-run shot by Min Byung-hun in the fifth inning. An threw 42 of his 80 pitches for strikes. The right-hander made 20 appearances, including five starts, as a rookie in 2018, going 2-4 with a 7.19 ERA. He was suspended for the early portion of the season by the Heroes, who belatedly learned that An assaulted teammates in high school. And it was during the postseason that An made his biggest impact. Across two playoff rounds, An allowed just two earned runs in 15 2/3 innings while striking out 18. Pundits and opposing hitters have gushed about An's stuff. Kiwoom's pitching coach, Brandon Knight, said earlier this week An has the ability to become "the best pitcher in this league, easily." An pitched one-hit ball through four innings, and prior to Min's home run, only two balls left the infield against the righty, who touched 147 kilometers per hour with his four-seam fastball. He issued four free passes, including one to An Joong-yeol to begin the fifth inning, with the Heroes leading 3-0. An Woo-jin struck out the next batter but then Min touched him for a two-run blast. An left a slider over the outer part of the plate, and Min parked it deep into left field seats. The pitcher stayed in the game to face one more batter and retired Son Ah-seop on a groundout to shortstop before handing things over to the bullpen. The Heroes put up a five-spot in the sixth inning, with Jerry Sands delivering the knockout blow with a three-run blast, and went on to win comfortably. An said he didn't throw as hard as he could have because he wanted to maintain precise control. On the home run, An said he knew he'd made a mistake as soon as the ball left his hand. "I wanted to get a groundball and tried to hit the lower part of the zone," An said. "I left it up too high. I told myself I won't make the same mistake and I put that home run out of my mind right away." An's role for the regular season isn't yet set in stone. Manager Jang Jung-suk said after Thursday's game that An is competing for a spot in the rotation, which is already deep. If he doesn't win the job, An could be deployed as an all-purpose reliever who can make some spot starts. An said his focus is not so much on the internal competition but on improving himself. "Every outing is an opportunity to learn, and today was no exception," he said. "I made mistakes that I can't afford to make during the regular season, and there were also things that I should try to execute consistently."